Geodes look like plain, weathered rocks on the outside, but hiding underneath are shimmering crystals. They often begin their lives as bubbles in volcanic rock. Over time, minerals form on the inside of the hollow shell, growing toward the center. Geodes can be found throughout the world, including in California, the American Southwest and several Midwestern states. These irresistible treasures have been popping up in home decor-form more and more. From coasters to planters and art to coffee tables, geodes and geode slices are a versatile way to incorporate natural elements into your home. Cacti + geodes make for the perfect earthy vibe. We suggest Rab Labs if you have a generous budget. We also got some good results searching terms like "geode" or "agate" on home decor sites such as wayfair. 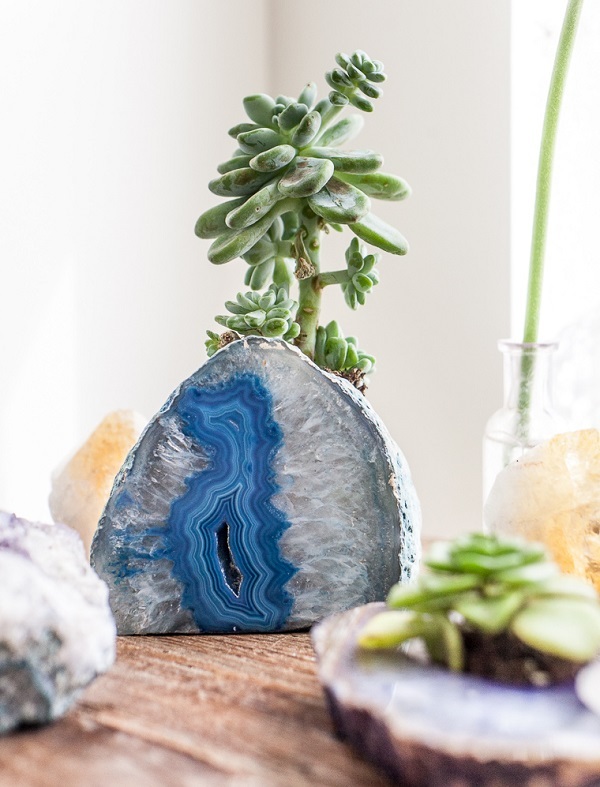 If you're a sucker for a little DIY project, purchase some geodes and simple home decor items, grab a glue gun and have some fun. Oh, and Ebay! Don't forget Ebay. Recently we were lucky enough to meet super talented artist Diane Tate DallasKidd at an open studio event in Sausalito. Since then, it's been impossible to stop dreaming of her ethereal wall hangings. Born and raised in San Francisco, DallasKid studied textile art in the Bay Area before furthering her education in Japan. While there, she studied under a fourth-generation dyer, and learned to use traditional techniques to create pieces for high end designers. The textured pieces are inspired by both urban and rural landscapes, and have been displayed across the U.S. and Japan. Often times the design process begins with a feeling, rather than a vision of the final product. We can't help but be inspired by these delicate, multi-dimensional designs.